I wrote this post in 2016. All of these things happen every summer in Kingston, Ontario. Most of the links will take you to the current year’s information. If you have any questions about the events in this post, feel free to contact me and I can find you current updates! Summer is a busy time. It’s also when time seems to speed up and fly by. Kingston is so beautiful in the summer. The waterfront, the busy downtown streets, and all the patios on which to enjoy a coffee or “other” beverage. Here’s a list of things we love to do with (or without) the kids in Kingston every summer. 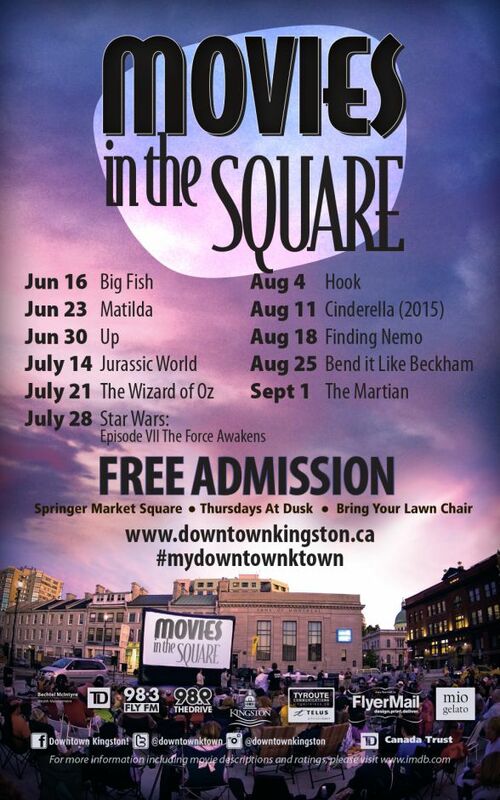 Movies In The Square – Almost every Thursday night from June 16th to Sept 1st Downtown Kingston shows a movie on a big blow up screen in Market Square. Bring your chairs and blankets, some snacks or some money for popcorn (we do all these things.) This years movie lineup (which we voted for earlier in the season) is now out – check the poster to the right or click the link above! – July 1st is a busy day in downtown Kingston. Head to Confederation Park for free live music all afternoon and fireworks in the evening. Buskers Rendezvous – Every July, Kingston holds the annual Buskers Rendezvous. Downtown Kingston’s site hasn’t been updated yet, but check the link later this summer and there will be lots of information there – performers, locations, and sometimes a map layout. We love the Buskers – I’ve been going every year since I was in university, and I’ve been taking the kids since they were born. It’s watch and then pay what you feel the act was worth. There are so many different talents on display during the rendezvous – jugglers, acrobats, musicians, artists, comedy acts, and a lot of the Buskers have fire elements to their shows. There’s a Fire Show on the Saturday night usually at 10pm – it’s been too late for my kids but it’s well worth the watch. I’ve even gone in the rain! Kick & Push Festival – This innovative theater festival usually begins in July and runs for a month. It will take place at various locations downtown. Last year we took Emma to see a play as part of this festival and she loved it (as did we!) This year Emma will be attending a theatre camp for a week that is a part of this festival as well. I’m very excited to see what sort of line up and productions come out this festival this year! Princess St Promenade (x2) – Twice each summer Princess St will be closed to vehicular traffic, and many stores and community groups take to the street to advertise and show off their great summer selections of products or programs. There’s lots to see, eat, do, and buy during the promenades – my kids favourite things to do are explore a city bus or tour trolley and get their faces painted! ArtFest – Canada Day Weekend – Here’s their promotional blurb from 2016: Located in beautiful City Park, Kingston. 150 Artists and Artisans from across Ontario and Quebec are in Kingston for THREE days starting Friday Canada Day, Saturday and Sunday. Walk the shady paths throughout the park. Enjoy outstanding pottery, glass, wood, jewellery, gourmet food, live music, art workshops and live outdoor theatre. poetry and more! Plan your weekend! You can’t miss Artfest! I took the girls last year and they saw so many beautiful things that I had to break down and buy them a necklace each. If I had unlimited funds I would have purchased so much more – everything was eye-catching and lovely. Tour Trolley 1000 Islands Cruises K-Pass – These tours are all part of the same company – a partnership between Tourism Kingston and The Great Waterway. The K-Pass gets you a pass to everything they offer (Fort Henry and Upper Canada Village*, and most of the museums in town, as well as the 1000 Island Cruises and the Tour Trolley Hop-On Hop-Off tours) for a set amount of time. If you are lucky enough to live in Kingston you can get a Kingston Season’s Pass – for $79 (kids 4-12 are $49 plus tax on both) you can have unlimited access to everything provided by the K-Pass for the entire season! I’m still on the fence about buying this because we get so busy and our weekends are usually booked up that I don’t know if we’d use the pass enough for it to pay for itself. Haunted Walk of Kingston – At 8pm most nights of the summer you can take a haunted tour of downtown Kingston. Emma and I have been on both the Haunted Walk tour, as well as the (newer) Time Travel Tour – both run by the same company. There are also haunted tours of Fort Henry which I think would be amazing as well. They appear to run more on the weekends. On a related note, there is also a ghost trolley tour available which I should have mentioned under number 9 above! This is, of course, not an exhaustive list (although I am exhausted from creating it!) of all the fun things happening in Kingston every summer. Some of the above links will have other items of interest to click through to. If you find anything really great that you think should be included in my list here, please comment below so others won’t miss out! *Upper Canada Village pass is only available after the seasons pass holder has been to Fort Henry – don’t know why, that’s what it says on the website.